The monumental complex of the Real Capizzi College (boarding and ordinary schools), was started on May 1st of 1774 and inaugurated on October 4 of 1778, by the initiative and perseverance of a humble brontese priest Eustachio Ignazio Capizzi who, during the fourteen years spent in the diocese of Monreale, gained an extraordinary experience in founding and building colleges. Ignazio Capizzi was feeling the cultural fervor and the willingness to study appearing in the first half of the XVIII° century even in Sicily; but he also felt, for having tested it personally, that of such fervor, alive in other centers of the island, Bronte was sentenced not to get the farthest echoes. He was forced himself to leave his country town to get an education. The country was lacking schools; illiteracy was ruling uncontested between the people of Bronte, still feudal property of the Big and New Hospital in Palermo, and only clergy and nobility could have access to studies. From this the generous design to provide his country town with an institution that would allow the people of Bronte to improve and grow culturally and, being considered, deservedly, a glorious achievement for the town, as it places Bronte, at least in the last two centuries, in a preeminent position over the other centers of Sicily. To realize his dream, the humble priest Capizzi had to face and overcome great difficulties and ostracisms but his enthusiasm and preparation was solid: The construction of the majestic College was completed in a relatively short time. The 25 June 1771, in a letter to the priest Sinatra of Bronte, Ignazio Capizzi selects the site where to build the schools, the neighborhood of S. Rocco in the center of the town. Two years later, in 1773, the land and few houses were bought from the doctor Rosario Stancanelli and on initiative of the Capizzi the priest Salvatore Marvuglia, architect of the Palermo Council, was sent to Bronte to inspect the place where the institute had to rise and draw its structure. Engaged the master carpenter Giuseppe Lupo, and given to him all the necessary drawings, the work started. The Capizzi himself came to Bronte, staying at the Capuchin convent, and placed the first stone the 1° May 1774. 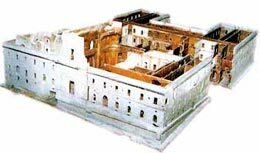 Not withstanding the many difficulties, the works proceeded with alacrity and a short time after were already completed the basement, the refectory, the kitchens and the first floor. In April of the 1777 many rooms were finished but the works proceeded till 1778, when, on the 15 of October, (four years after the placing of the first stone), finally the new school was open. All this was not an easy task: Ignazio Capizzi had to overcome lots of obstacles, ironies, clashes and calumnies of every kind; he had to beg everywhere for the necessary recourses; In the end he had the support of everybody. On the 18 April 1778 King Ferdinand issued a decree by which the erection of the public schools in Bronte, at the expenses of the Archiepiscopal Table Of Monreale, had to comprise five schools: arithmetic, lower and superior grammar, philosophy and theology. In September were ready all the rooms for the school, the refectory, the kitchen and the first floor for the boarders and the superiors. With a deed drawn by the notary Abbadessa, Ignazio Capizzi nominates the first superiors of the College: Rector the priest Placido Minissale, Visitors dean Placido Diner, External Vicar priest Bernadette Verso and the Confessor of the Santa Scholastic monastery; Deputies the priests G. Puccini and Puerto Oscillator, The baron V. Meli and Carlo Stancanelli; rational D. F. Galvan. The 15 of October 1878 (four years from the start), was celebrated the solemn opening of the school. There were 37 boarding students, coming from Bronte, Cesarò, Castell'Umberto, Biancavilla, Nicosia, Patti, Centuripe, Pettineo, Randazzo, Mascali Troina, Regalbuto, Roccella, Francavilla and, even 10 from Gangi. The boarding fee was 14,25 onzes per year. 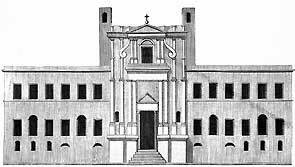 In the 1781 the kingdom president, D. Antonio Cortada, approves the regulations of the College drawn by the priest Capizzi. The first balance 1778-79 was closed with a loss of 108 onzes, anticipated by the rector Minissale (total income 585 onzes, expenses 693). The College did not possess anything else, but many brontese bene­factors were still giving natural contributes (sheep, wheat, etc.). 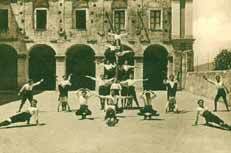 The following year, 1779-80, the boarders were 55, coming also from Maletto, Sperlinga, Alcara, Castiglione, and the Municipal Council of Bronte helped by conceding a contribution (the "scasciato") in favor of 15 boarding students. Obviously there were initial difficulties common to any activity, also because most goods necessary to the life of the college were purchased in other centers: pasta in Giarre; beans in Mascali; walnuts, hazelnuts, chestnuts in Randazzo; cheeses in Francavilla; wine in Linguaglossa and Piedimonte, etc.. The deputies then decided to lease some land to grow their own cattle and sheep (they took in lease an enclosure and open grazing land in Malaga district (with a salary to the farmer of 6 onzes a year). In the meantime the number of the boarding students kept growing: in 1780-81, three years after the opening, were 63, coming, especially, from Ucria, Ficarra, Militello, Cerami; 66 in 1781-82 coming also from Castelbuono, Capizzi, Mirto, Sperlinga, Galati Mamertino, Barcellona Pozzo di Gotto, Tortorici, Raccuia, Mistretta, Valguarnera, S. Salvatore di Fitalia, Caprileone, S. Marco, Caronia, Tusa. 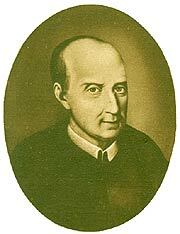 Two years after, in 1883, Ignazio Capizzi died at Palermo in the Olivella convent’, where he was living; the humble priest after the inauguration of the College very few times came to Bronte as he was sure to have entrusted it to people and priests not only honest and able but profoundly committed to the success of the institute. After twenty years, in 1796-97, the boarders were already 195. The library was stocked with other books and the internal chapel with sacred furnishings. It was built also a little theatre which was afterward lost. 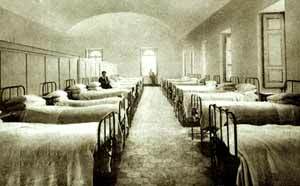 Were also built other school rooms and dormitories. To the boarding students, besides the catechism and the daily mess, were not suggested further religious practices. The start of the lessons was fixed at the 15 of October and the end at the 31st of August; holyday every Thursday afternoon and from the 1st of September to the 14th of October. The College had to bear considerable cost, for the food of the boarders. Everything had to be bought in localities often distant from Bronte and middlemen had to be sent, during harvest, in the various places of production of the goods to be purchased. It is hard to imagine the long chain of mules that used to wind through the roads up to the far towns of the Nebrodi. That also implied the preparation of space adapt to this use. In other words the College became in little time a source of work not only for the internal employee but also for a large number of workers to whom it was insured a job and economic tranquility. It was produced this way in Bronte a welfare never seen before. From 1805 to 1807 the fourth wing of the College was built. The works were resumed after the pause of 1820-21 with the expense of 238 onzes for the construction of the courtyard. 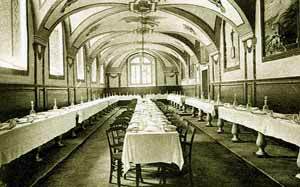 The 1st of November 1846 was started the new chapel costing 314 onzes including the contribution of 12 tarì per year requested to every boarding student. The immediate success of the College (in 20 years the initial 37 boarders of 1778 became 195 in 1797) was also due to the ability of the management adapted to the scholastic field, abreast of time, updating and increasing teaching subjects, that is surpassing the old scholastic schemes so usual, at the time, in the Jesuitical colleges. Starting in 1778, by decree of King Ferdinand, with teaching of reading and writing, humanity and rhetoric; in 1782-83 rhetoric is separated from humanity and two new distinct professors were established. In 1808 the subjects had become ten: reading and writing, 2nd class, 4th minor and 4th major, humanity, rhetoric, philosophy, theology, to which in 1810 was added singing. In 1837, when the name was changed in "Real Bourbon College", was introduced a normal method and the class of reading and writing was called "school of the young ones"; was added the teaching of Italian language while the theology was divided in dogmatic and moral. In 1850 was taught Italian literature, eloquence, geography and French; four years later. canon law, mathematics, calligraphy and, in 1864, physics. Certainly, the facts that in that period shocked Italy and Europe and the donation made by Ferdinand IV in 1799 of the brontese territory to admiral Horatio Nelson, had a negative influence on the life of the College: the conditions of the brontese people worsened and the Council bled itself white in continue court cases to defend its own rights with an increasing internal conflicts between middle class and farm laborers that eventually culminated in the terrible facts of 1848 and of 1860. How not to hold against the light and see the difference between the Nelson Dukedom and the College: there only economic interests, sometime inequitable and oppressive, here the banner of culture and social elevation of the people, radiated even in lands not close to Bronte. With the Italian unity the state centralization caused more crisis to the College: in 1863-64 the boarders gets down to 134 and the school fee rises to 24 onzes, in 1883 the institute reaches a minimum of 50 students. In the same year, with the introduction of petrol lighting, were installed in the corridors, in the refectory and in the dormitories 62 crystal lights and was perfected the last quarter of the College at a cost of 226 onzes. In 1892 the College was entrusted to the Salesians who lasted until 1914. In the same year the rector don Giuseppe Prestianni (one of the well deserving founders of our civic Hospital ) made restore and complete the edifice. The paving of the entire institute was done again in cement and all the original flight of steps in lava stone and bricks replaced with marble. Against the advice of the eng Caselli, that wanted to reassemble the architectonic unity of the College, was erected also a new edifice to be used as shops and houses to let. «This way, wrote Benedetto Radice, submitting the beauty to the useful, speculation killed aesthetics». 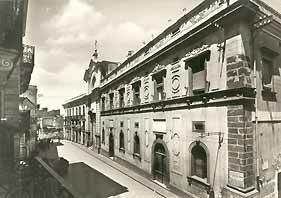 Towards the middle of the XIX century, being increased the number of the boarders some corridors were restructured and changed to dormitories. After the construction of Bronte’s aqueduct, in 1940, the College was provided with a very modern plant of bathrooms and showers. Few years later, in July 1943, the Capizzi College was occupied by the military authorities and used as a hospital, was partially damaged by the disastrous bombing of the allied forces while a corner of it was blown up, with mines, by the Germans. The twenty years commitment, from 1945 to 1966, of the new rector, father Giuseppe Calanna and his deputy, father Giuseppe Zingale, was responsible for its renewal and its recovery. His rector ship, that lasted until few years ago, when because of changed social-cultural conditions, the educational institute and the boarding school were shut down, represents more than a quarter of the long and fascinating history of the College. Rapidly the boarders, from counting only thirty during the war, went up to 160. All the parts damaged by the bombing were rebuilt, the new internal areas were restructured, the dormitories, the gym, the kitchens, the hygienic services were renovated, and the refectory and school rooms were modernized. And, finally, the rector Calanna and his deputy, father Zingale, succeeded in achieving an old desire of all the people of Bronte: the transfer, after 211 years from his death, of the remains of the Ven. Ignazio Capizzi from Palermo to Bronte where they rest from the 17th of April 1994. The Capizzi was built by the people with the contribution of the Bourbon sovereigns ("Populus aedificavit, Rex dotavit", was written on a tombstone placed on the front of the college). Because of this was called Bourbon College from the initial name of Education House; subsequently, in 1848, on initiative of the abbot Giuseppe Castiglione, equal of the kingdom, the Sicilian Parliament called it "National College"; after the unity of Italy still changed name in that of "Real Capizzi College". And such remained till today. Thanks to the illuminated direction of a few cultured rectors Giuseppe Saitta, Giacomo Biuso, Francesco Tirendi) and the work of teachers like Luigi Pareti and Vincenzo Schilirò, the College became in those centuries the most important cultural center of Eastern Sicily (think that in 1845 the number of the boarders was reaching 300, almost 400 in 1851). In the Capizzi College for over two centuries, was formed a good part of the Sicilian managing class. In 1886, in the Italian Parliament, the Minister Longhi defined it "forum of the Latinism". Bronte and the south owes so much to the humble priest Ignazio Capizzi and to the college that he wanted: from '700 to nearly all the 800, the Capizzi College, which in those centuries had become the big forge of Sicilian knowledge, shaped a country town fecund of illustrious personalities; formed an impressive line of "elected intelligences", famous prelates, pious men , philosophers, Latin poets, jurists and economists, famous doctors. The wooden model made in 1773 by the master carpenter of Bronte Giuseppe Lupo. 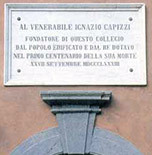 It is preserved in the Capizzi College. Il Capizzi oggi: il nucleo storico è quello a destra, al centro la Chiesa del Sacro Cuore (1907), l'ala a sinistra è stata eretta nel 1892.
the Direction and to the Treasurer's office. But, above all, for over a century, made Bronte become a powerful beacon of culture. A great deal of Sicilians and Calabrians, until the recent years fifty, studied and were formed in the Capizzi College: between the others we like to remember Arcangelo Spedalieri, Antonino, Placido e Gesualdo De Luca, the brothers Cimbali (Enrico, Giuseppe, Eduardo), Benedetto Radice, Alessandro D'Antona (from Riesi, senator and surgeon), Luigi Capuana (from Mineo, writer), Piccolo Cupani (from Mineo, general procurator and first governor of Eritrea), Mons. S. Nicotra (from Barcelona, apostolic auditor to Vienna), etc..
Luigi Capuana, remembering with pleasure the years spent in the Capizzi (from 1851 to 1854), an evening of 1910 was telling Benedetto Radice that "there, in college, began his writing fever". Obviously, in the last period, the school had become of elite and exclusive for the cost of the studies that was equivalent to the prestige and the tenor of the school itself. Now, closed the college, the Real Capizzi College tries to enter a new operating phase, which completes the first, traditional and specific - teaching of doctrine and the human letters -, assuming the function of the educator center for the standing formation of the citizen. Thanks also to the initiative spirit and to the contribution of Nunzio Sciavarrello, part of the college will become finally seat of a rich art gallery. Will collect up to 500 international graphics works, donated by the institute for culture and art (on initiative of his president Nunzio Sciavarrello) besides paintings, sculptures and drawings of brontese artists (Rosetta Zingale and others) and artists coming from well over 50 nations. The premises of the college contain a prestigious library and precious archives of the local history. Preserve an ancient and still efficient scientific laboratory (installed in 1924, with physics devices, natural and chemical sciences), a little collection of archaeological finds, an ancient musical tool to keyboard (spinetta, recently restored, that belonged to the philosopher Nicola Spedalieri), his self-portrait (of 1773), a scale model in wood reproducing the College in the ancient version and his completion as it had been conceived in the original version, works of the brontese painters Agostino Attinà (1841-1893), Nunziato Petralia (1859-1936), Rosetta Zingale and several other canvas of particular interest. 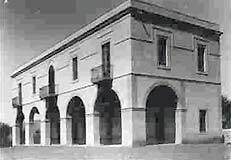 "What the Capizzi College has represented as radiation center of culture for eastern Sicily and as transition point from the old to the new for the local middle class, would be easy to demonstrate by showing the place of origin of the boarding school students, especially the most distant and less known. However, we wish to point out that there was no city or town, from the mountains to the cost, from where boarder students would not come to study in Bronte. From Capizzi, Nicosia, Valguarnera, Mistretta, and even from Palermo; Comiso, Modica, Acireale, Alimena; Augusta, Lipari, Aci S. Antonio, Messina, Castroreale, Resuttana; Catania, Vizzini, S. Margherita Belice; S. Piero Patti, Chiaramonte, Frazzanò and Taormina. This can generate wonder on how would be possible that, on places so distant and with absolutely inadequate means of transportation of the time, the College of Bronte could rise such interest. ; nor would surprise us that the new Sicilian nobility would find in Bronte the means for their cultural formation. The Capizzi Royal College shall contribute to the most complete, physical, intellectual and moral formation of the young people admitted to it. The teaching includes primary school, equalised gymnasium ( whose exams are equal to those sustained in state schools ), courses of secondary school waiting to be equalised, scholastic pre-military battalion, sport team “Nova Juventus” and optional piano and foreign language courses. The fee for the scholastic year is L. 2.000,00, to be paid in two instalments: the first when the pupil enters the boarding school and the second on the 1° of February. 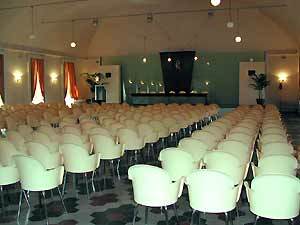 The scholastic year, for board and lodging, starts on the 1° of October and ends after the Summer session’s exams […]. Each boarder shall pay also: L. 100, once only, as admission fee when a registration number is requested; L. 100 for the use of furniture (steel bedding with wire netting. bedside table, study desk, two chairs and dinner and cutlery service), regular doctors visits, infirmary service, hairdressing etc. ; and L. 15 monthly for laundry. The cost of books, stationery, government school tax, optional lessons, mail etc. shall be at the expense of the boarder’s family. Piano lessons and its use L. 20 per month […]. All other expenses shall be charged at the end of the year, provided the family has deposited from the start L. 200,00. At breakfast: Milk and coffee, or black coffee, with bread. At lunch: Soup (pasta or minestrone); two courses: meat or fish with vegetables; fruit and wine; bread as wanted. 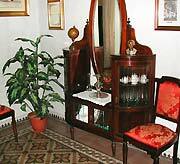 At dinner: Soup, one course of meat or fish or eggs, fruit and wine and bread as wanted. At lunch, on important holydays, a dessert shall be served also. Dress uniform; and working clothes. Six shirts, six underpants, eight pairs of socks, twelve starched high collars (in cloth, closed military style), four pairs of cuffs, black skin gloves, six towels, six napkins, twelve white handkerchiefs, two little cloth bags for laundry. Two pairs of black ankle-boots, two pair of house shoes of any shape. Combs, mirror, toothbrush and hair and clothes brushes. The fund also includes what is needed for the bed: two mattresses two pillows, three pairs of sheets, six pillowcases, a woollen blanket, a quilt, a white bedspread, a bed mat. The Administration can supply the mattresses, one woollen and one of straw and the pillows both woollen, for L. 50 per year. But this has to be booked immediately as the College cannot provide for more than 100 beds. All the objects of the fund must be signed with the registration number, that the Rector will enclose to the acceptance letter, and have to be delivered to the wardrobe, that shall issue a receipt. N.B. It is recommended that all boarders bring, for the first night, at the least the bed linen and the cutlery with relative napkin, independently of the arrival of his baggage which must be addressed to the name of the boarder. The "Colleggetto" (little college), house of summer holiday of the boarders of the Capizzi college. It rose in district San Nicola, fairly close to Bronte, in front of a soccer field; it was razed to the ground and completely destroyed during the bombardments of 1943. The sporting field , the "glorious" San Nicola, until few years ago was still lodging the local championships of soccer. 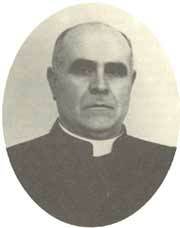 Father Giuseppe Calanna, rector of the Capiz­zi College since 1946. His principal characte­ristics can be sum­marized in two words “to oversee and to love”. He was a descen­dant of that Pietro Calan­na foun­der of the first schools in Bron­te for young girls. (from the via Card. De Luca). 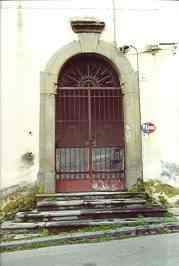 It will become the main entry to the Art Gallery Of Bronte that will be lodged in the basement floor of the Capizzi.